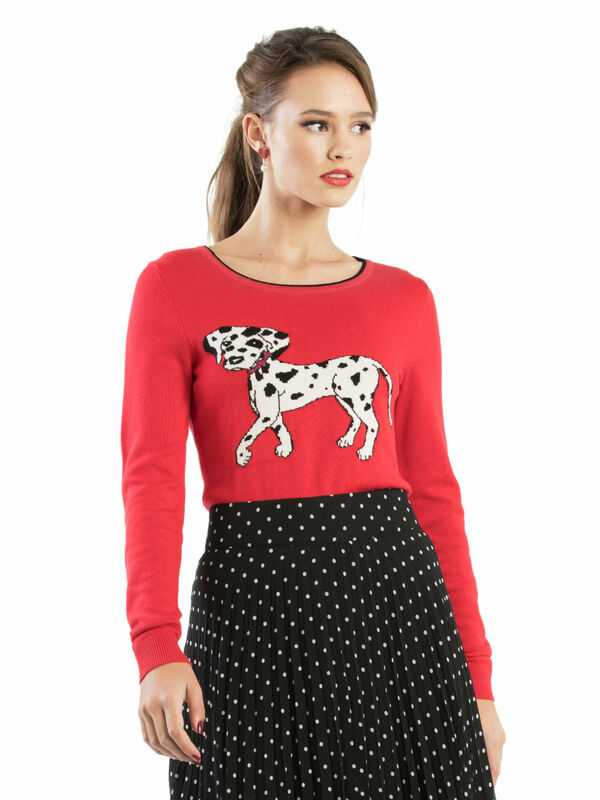 Puppy Love Jumper https://www.review-australia.com/au/puppy-love-jumper-red/RE19KW127.RERED001.html This sparky, bright red jumper is as irresistible as the Dalmatian on its chest! Sporting a glittering metallic pink collar and gazing out with loving eyes, this sweet pup is your perfect companion this season. Scalloped black piping around the collar and a keyhole neck closure at the back gives this cosy knit a smart finish. Worn with Beauty Spot skirt and Brenda Heels. 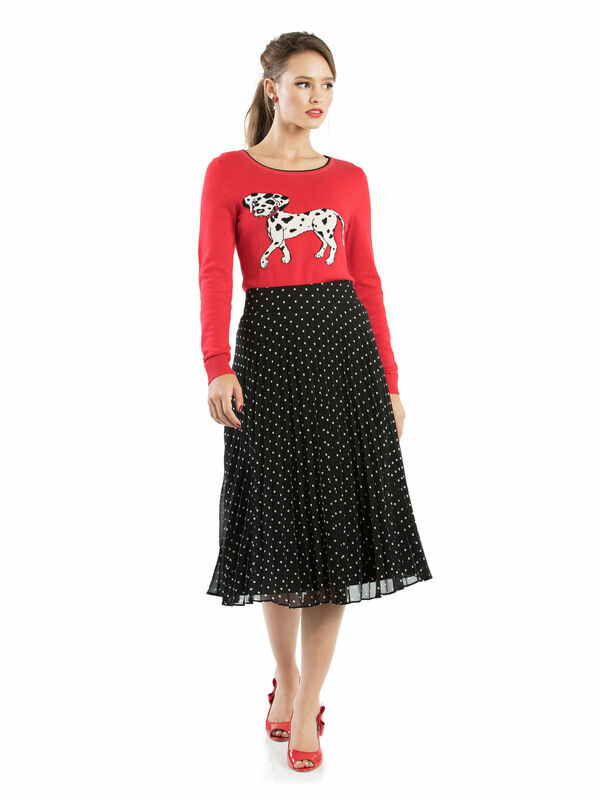 This sparky, bright red jumper is as irresistible as the Dalmatian on its chest! Sporting a glittering metallic pink collar and gazing out with loving eyes, this sweet pup is your perfect companion this season. Scalloped black piping around the collar and a keyhole neck closure at the back gives this cosy knit a smart finish. Puppy Love Jumper is rated 5.0 out of 5 by 4. Rated 5 out of 5 by mamar from The most beautiful Jumper. I have bought countless cardigans and review jumpers but this one is the winner, vibrant colours and great quality. Taking to Paris disneyland with me at the end of May to when I go to my sons wedding in Paris. Rated 5 out of 5 by Christina#16 from Brilliant red jumper with Dalmatian puppy I saw this jumper in the window whilst passing the store. 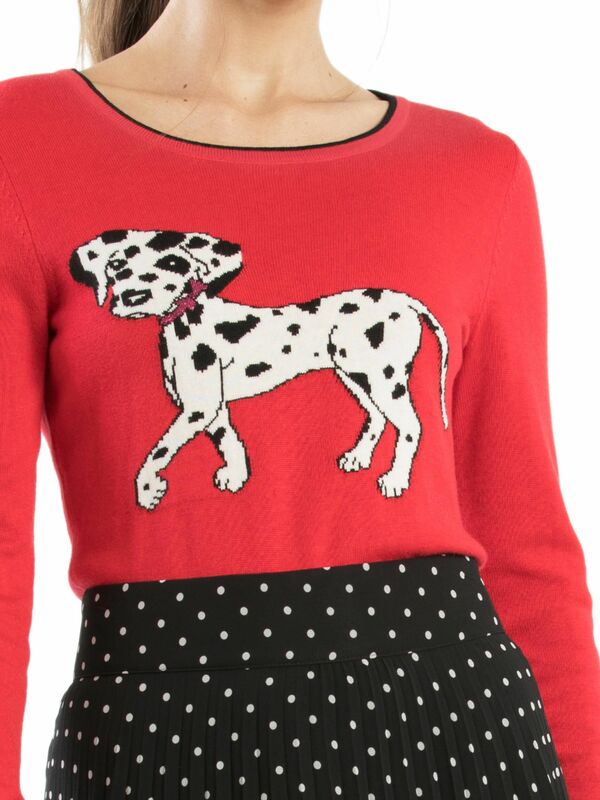 I loved the Dalmatian puppy design on a brilliant red jumper and simply had to have it. Rated 5 out of 5 by LisaT from Perfect knit This is the most adorable knit I own. Gorgeous red, cute picture and nice and warm. This is going to be a staple in my wardrobe as the months get cooler! !